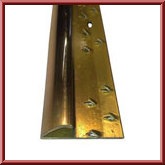 Carpet threshold single naplock plates suitable for ending carpet to vinyl finishes.You can also use these door bars for ending carpet to no flooring , ie when the joining area has floorboards. Available in two finishes either polished aluminium ideal for the more modern household or the more traditional home brass effect. They come in 35" lengths. With pre drilled holes for fixing and carpet grip spikes for holding carpet in position after being stretched. Use these threshold plates at doorways instead of carpet gripper to join the next room or hallway flooring. When choosing the colour of your door bar threshold plates remember to match with existing door handles and light fittings. 7 Lengths is enough to cover the doorways of an average sized house. Easy to cut and install aluminium.